Named and themed in celebration of the earliest development of human language, Ugga Bugga is an innovative multi-spin slot which is far from primitive. The setup of the slot, in fact, is one of the most imaginative and unique around, featuring ten separate reels rather than paylines and introducing a handful of other interesting features. Far more than just a funny name, then, Ugga Bugga is a slot that can deliver hours of entertainment. The slot’s innovative ten reel setup allows it to boast an impressively high 99.07% theoretical return to player percentage. A plethora of coin value and coin per reel options, allows players to set their stake per spin anywhere between 10p and £250. A top potential jackpot of £25,000, whilst generous, is far lower than that offered by many other slots. Payouts below that top jackpot do tend to fall away in value quite rapidly. Beyond the interesting ten reel format, Ugga Bugga does not include many other features to liven up its gameplay. 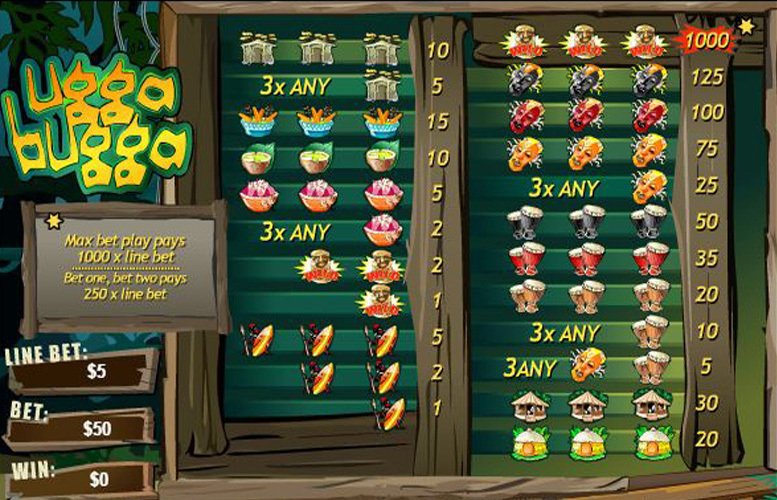 Innovatively formatted, Ugga Bugga is a multi-spin slot game that is probably best described as being an interlinked connection of ten different reels. On the first spin of a game round, only one reel displays symbols and players can then hold the symbols that they like, to be displayed on each of the ten reels after a second spin. The aim, therefore, is to make up the most valuable possible three symbol combinations on as many of the reels as possible. The most valuable such combination of all, comprises three of the game’s golden idol wilds which pays out at a rate of 1000 times a player’s bet per reel. That means that at the highest possible bet level per reel, of £25, the top payline jackpot is £25,000. The most notable feature of the Ugga Bugga slot is the multi-spin capability which we have already described above. Beyond that, the game’s only other additional feature is the presence of its wild symbols. The wild symbols featured within Ugga Bugga display a golden tribal icon and play two notable roles. Firstly, as explained above, they combine to form the slot’s most valuable possible payline combination. As well as that, however, the symbols also work as traditional wilds in that they can substitute for any other symbol on the reels. When doing so they will always go towards making up the most valuable combination possible given the other symbols on show. Whilst the golden idol wild symbols are unquestionably the most valuable featured on the Ugga Bugga reels, there are a wide variety of other symbols that can also trigger impressive payouts. The most valuable symbols behind the wild, in fact, are those depicting different colours of tribal mask. Three consecutive black tribal masks on one of the game’s reels, for instance, pays out at a rate equal to 125 times the player’s bet per reel. Three red masks, meanwhile, deliver a jackpot worth 100 times the bet and three orange masks are worth 75 times the player’s wager. As Ugga Bugga replaces paylines with separate reels, that does remove one way in which players can alter their bet amount per spin. The slot makes up for that, however, by allowing an excellent degree of control over both coin values and the number of coins able to be bet per reel. Players can set their coin value at a wide variety of different levels between 1p and £2.50, and can also choose to bet anywhere from one to ten coins per reel. That means that a minimum bet of just 10p is possible and that a maximum bet of £250 is also available. Ugga Bugga is a slot game which has to rate highly for originality and for overall return to player percentage, but which also has a number of notable weaknesses. The ten reel setup and the way in which that is connected to multi-spin capability gives players a great chance to achieve regular winnings. Aside from the top payline jackpot of £25,000, however, payouts do tend to be on the less generous side when compared to other slot games. 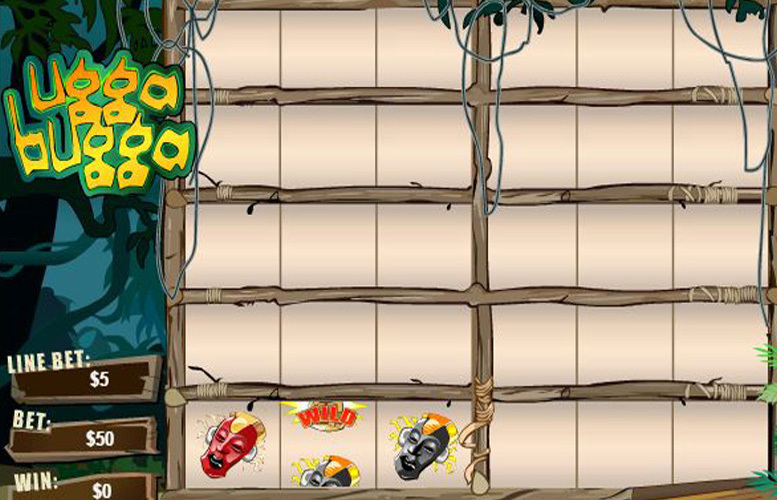 Ugga Bugga gameplay, too, is generally more simplistic and repetitive than some other game options, with wild symbols comprising the slot’s only additional feature. The slot’s range of available stake alternatives, however, is an additional area where it excels. All in all, therefore, if you want a slot that is likely to pay out regular but smaller amounts, then Ugga Bugga might be right up your street. Otherwise, however, you might want to explore some of your other options. This game has a rating of 9 / 5 with 622 total reviews by the users.